Need a fashion blazer to wear with your favorite jeans on a Friday night. Something that is eye catching but not over the top when it comes to style. Well, the makers of Zacchi have the mens fashion blazer for you. 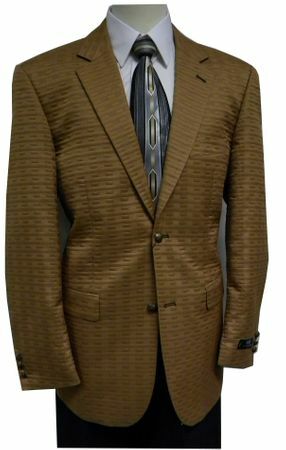 The Sherman by Zacchi is a camel color fashion blazer made out of luxurious mini quilt fabric that is both great looking and high quality. Zacchi makes fine made suits and this blazer is no different with a hand stitched french faced lining, floating chest piece made of canvas which gives shape to the blazer and is just a fine work of mens fashion to wear with either jeans or some black slacks. The quilted fabric of this blazer is what really makes the whole thing unique and you're sure not to see anyone else in the club wearing a blazer that looks anything like this one.